Kieron damaged his PL Race Buggy at Atmos 09 destroying the forks, he came to me asking what could be done. He already had a Buggybags Seat, so I told him to take the axle off, and throw the rest away. He sent me the axle and also said he wanted suspension on the front end too…after a few weeks this is what rolled out of my garage. When I first started kite buggying, back in 1994, my buggy was a home-made affair – knocked together from scrap mild steel lying around the sculpture studio, with a plastic school chair perched on top serving duty as the seat! Power came from a stack of 6′ Flexi stackers: they generated plenty of it, but with no lateral support I was constantly skidding off the seat and crashing the kites. 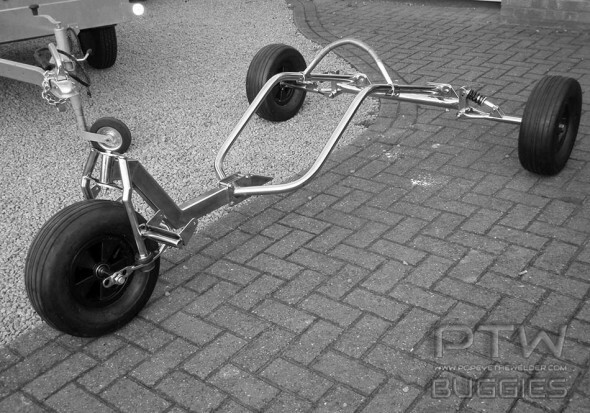 I’d have to start all over again (this was in the days before traction kiting was banned at Epsom racecourse). It was hopeless. I almost gave up. Then, my friend Adam made me a much more professional affair as a wedding present: this one was the one that sealed my fate, as it were, addicting me to kite buggying for the rest of my life. It had proper side rails meaning I could hold down much more power, and actually get somewhere without being dragged sideways out of the buggy! A good thing too because by this time I’d met Chris Sands and bought a set of four line foil plans from him: these were for Skytiger type kites and raised the bar in power considerably. 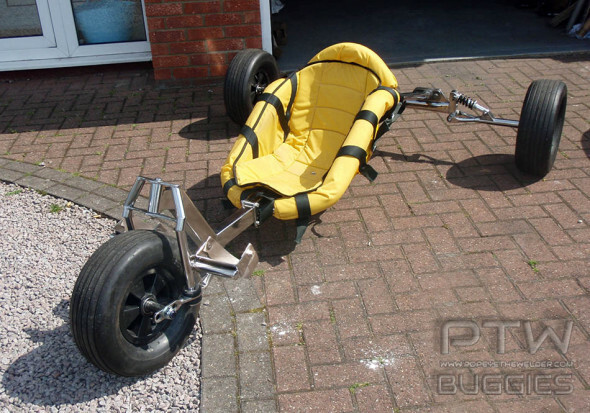 That buggy served me faithfully until one day I saw a Peter Lynn race buggy in the Covent Garden Kite Store – would you believe it, it had suspension! I had to have it, and still being impoverished having only just recently graduated, I put it on layaway and paid a little towards it each week. That was the buggy that saw me through the next ten years and which I loved to bits; but time took its toll, and a spectacular crash at Atmosphere 09 finally consigned the forks & headset to the grave. I was very upset. What to do? The cheep and simple solution was to buy another PL headset and have done with it. There was a but though. I had made the mistake of sitting in a gorgeous stainless steel buggy parked outside the BuggyBags tent at Atmosphere 09, and I couldn’t get it out of my mind. It was the PTW Cheetah (Popeye The Welder) and it fitted like a glove – I was absolutely astonished; it made my battered old PL buggy seem like a very poor relation indeed! I got Popeye’s email from his website, and got in touch. Yes, of course he could do it for me; but, “wouldn’t it be better to ditch the rest of the PL and build anew?” he asked. 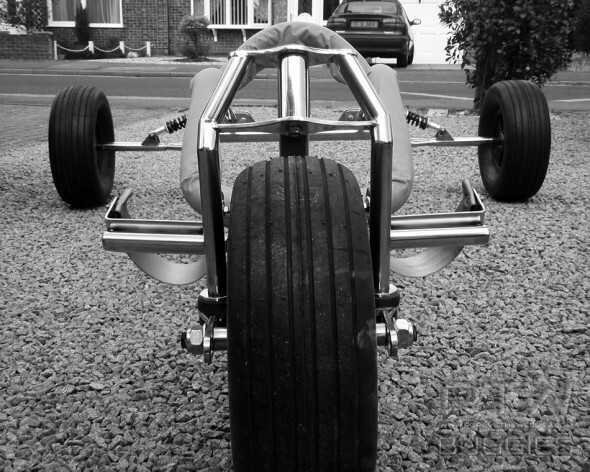 “You could keep the PL rear axle, build new from there forwards and have suspension all round” he said. Thankfully I had some spare cash and so a process of planning began. First of all Popeye asked me to measure the geometry of the PL buggy I’d loved so much, then measure myself, then post him my back axle – which we’d agreed would be kept. To say that progress was tantalising is to be a master in the art of understatement – I was without a buggy; I NEEDED one! When the dimensions were agreed upon Popeye started sending me photos of the build as it progressed, each successive one whetting my appetite further. Time ticked by until the day she was ready and I dropped everything to jump in the car to collect her. When I arrived at Popeye’s place in Lincoln I was greeted by a veritable Aladdin’s Cave of Buggying Heaven: his garage containing the sweetest collection of kite buggies you’re ever likely to see, each one a work of art – Popeye really, really, knows his stuff. And Good God that man can weld! The finish was superb; better than I dared to hope. 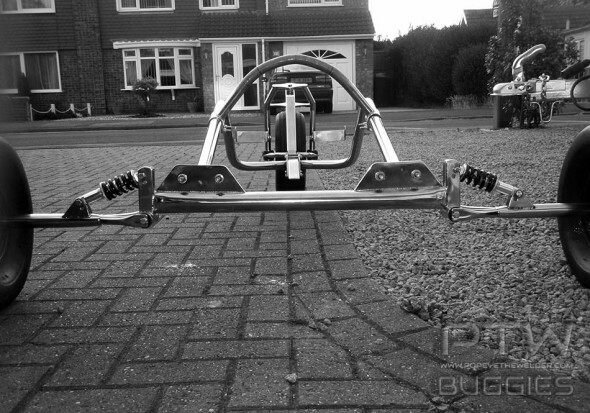 My buggy was waiting for me on his drive, wanting only for the fitting of my BuggyBags race seat. Once fitted I hopped in and a Cheshire Cat settled itself on my face: wow, she was, and I can say this without fear of contradiction (it having now been verified by everyone else who’s sat in her), the most comfortable buggy I’ve ever been in. I was thrilled and couldn’t wait to get her to the park for her first outing. And what can I say about that first session? Well, I hit my personal best of 25 mph (for the park, which is very small) within minutes, and went on to buggy for hour after hour – I could quite happily have carried on, but the light faded ending one of the best day’s buggying I’ve ever had. I sprang from the buggy fresh as a daisy, the normal aching limbs absence being a testament to the armchair smooth ride. In use she’s a delight – I can hold down much more power than I ever could in my Peter Lynn, and she tracks straight and true the whole time, only drifting into controlled over-steer if I want her to. After that first session I gave Popeye some feedback, feeling that the turn circle was a little larger than I was used to and after a bit of discussion about how best to fix it, came up with a design for some footpeg extensions – because I was pressed for time (well, just impatient if I’m honest) I got a quote from a local fabricator to get them made – unbelievably they wanted over £200 each for them! A quick call to Popeye & he said he’d make them for a tenth of that – they were with me three days later. So, let’s add astonishing service to the list of Popeye’s many merits. I haven’t yet had her on a beach, but I’m sure that when I do she’ll feel rock solid as I aim for my next personal best of over 50 mph. Throughout the build, and after collecting her, Popeye was fantastic to work with: he really does take pride in his craft – and rightly so – I doubt you’ll find anything the equal of a PTW buggy anywhere else in the world; they truly are works of art. If you’re thinking of spending Race Buggy money on an off the shelf buggy from ANY of the major manufacturers, my advice is, don’t, get in touch with Popeye instead.